Would you pay $150 for a pair of sunglasses? Designer sunglasses can easily cost well into the thousands. 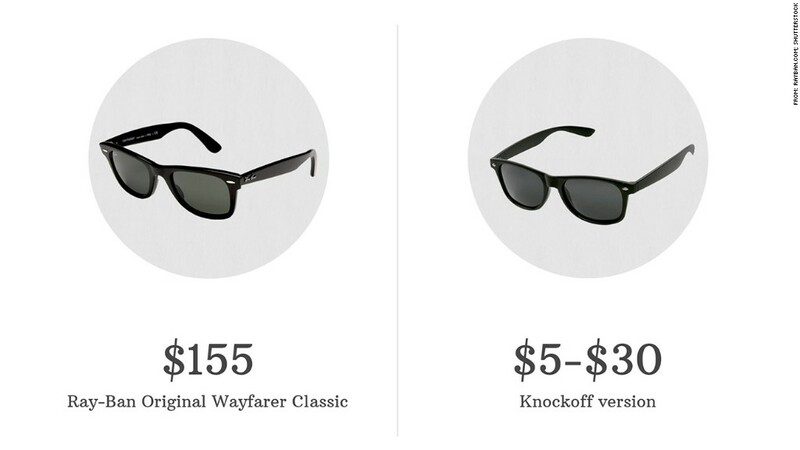 One popular and iconic pair -- the Ray-Ban Original Wayfarer Classic -- comes with a price tag of $155. The brand's been copied relentlessly, with knockoffs available for as little as a few dollars. But what does the brand name pair in the glass case offer that the imitations don't? Crystal lenses, which are tinted on the back and made of glass, adorn several different models of the Wayfarers, said Sara Beneventi, global brand director for Ray-Ban, who says they offer better clarity. "We don't have plastic lenses," she said. Name brands, including Ray-Ban, typically offer lenses with UV protection, and some take it a step further with polarized lenses, which can also notch up the price. There's also manufacturing costs. "All the lenses are made in Italy," Beneventi said, as are all the Wayfarer components. "No part of the product is made in China." She said Ray-Ban focuses on long-term quality, making sure the materials used don't peel or change their shape with wear and tear. Formula One driver Jenson Button, actress Sadie Frost and a man at London Fashion Week were all spotted wearing the iconic Ray-Ban Wayfarer. "It's laser cut to make sure it's very light and comfortable for consumers," said Beneventi. The Wayfarer frames are usually made of acetate, a type of plastic that can be costly to manufacture. "The technology to make an acetate frame is extremely difficult," said Colleen Gallagher, the district manager of New York City's Solstice Sunglasses boutiques. She agreed that the value of each pair of sunglasses really depends on what it's made of and how it's constructed. "You're not just paying for the name. You're paying for the craftsmanship," she said. Gallagher, who started out in the eyewear business as a teenager selling sunglasses on the Jersey Shore, had a new pair of $495 Fendi sunglasses keeping her hair off her face. Each pair takes 100 days to make, and during the manufacturing process the frames are tossed in wood chips to give them a lustrous shine. "It's a passion," she said. But not everyone shares that passion for designer sunglasses. Lois Bitner Olson, a marketing professor at San Diego State University, claims that all glasses can be manufactured cheaply and easily and brand labels are the primary reason customers pay more. "Unless they're made with real gold or silver or tortoise shell, they can be made for less than three dollars," said Olson. That's all sunglasses, she said, regardless of the brand. Olson says there's only one reason why consumers spend big bucks on shades. "Sunglasses are such an ego-driven product -- it's all about me and what you see on my face," she said. "I'm not looking at your socks, I'm not looking at your belt, I'm looking at your face. It's kind of the window into you."